I’ve made long lists of “What Not To Do” that I use to help me when I’m writing/rewriting a manuscript. Some items are easy to track down and fix; others take some time and possibly a keen-eyed, critical reader. Here are seven DONT’S that I think are very important. 1. Don’t use twenty words when ten will do. Poor writing is caused when writers don’t use effective sentence structures that have been proven to produce excellent prose. Not using effective sentence structures produces poor writing. A lot of that poor sentence structure (what readers often diagnose as “awkward” prose) is the use of passive voice. That means you’ve buried the subject of the sentence at the end, put the object in the subject position, and used the BE Verb + the past participle instead of a strong active verb. Arrrg! It works in academic prose (I think to impress) or legalese (I’m sure to confuse), but not in fiction. 2. Don’t make your reader guess who this story is going to be about and why s/he should care about them. Make those characters want or need something as soon as possible. Make it clear that Hildegarde Pink is the MC and she wants to climb that mountain. Or that Dirk Brainwave is the hero and he’s on the way to rescue his true love. Then drop the bomb. Hildegarde is crippled and can’t walk. Dirk’s in jail and there’s no way he’ll get out in time to save that girl. 3. Don’t focus on minor characters just get the backstory in, especially at the beginning of your book. The start should always be about forward movement. 6. Don’t let your middle sag. This is not personal. This is about writing, and this is a difficult part. Even if your characters are amazing and your plot stunning, you’ve got to keep the pacing up. If you’ve got a ticking clock, shorten the time, delay the hero. If you’ve got your quest underway and all is going smoothly, send in the super villain and mess things up. 7. Don’t fall into the “and then” trap. “I glanced at the clock and my teacher scowled. Then I pretended to be doing the assignment. After that I turned in my paper and left.” We need to know what people do in the story, but not in this flat, linear, uncreative way. Besides, what did all of that glancing, scowling, turning in, and leaving do to reveal more about the character or create interest in the story? C. Lee McKenzie is a native Californian who grew up in a lot of different places; then landed in the Santa Cruz Mountains where she lives with her family and miscellaneous pets. She writes most of the time, gardens and hikes and does yoga a lot, and then travels whenever she can. She takes on modern issues that today’s teens face in their daily lives. Her first young adult novel, Sliding on the Edge, which dealt with cutting and suicide was published in 2009. Her second, titled The Princess of Las Pulgas, dealing with a family who loses everything and must rebuild their lives came out in 2010. Her short story,Premeditated Cat, appears in the anthology, The First Time, and her Into the Sea of Dew is part of a collection, Twoand Twenty Dark Tales. In 2012, her first middle grade novel, Alligators Overhead, came out. Double Negative is her third young adult novel. Hey all! Today I welcome Sean to my blog as part of his book tour. If you’re looking for my IWSG post, it’s here. Post-Apocalyptic fiction: what it is and what it isn’t. There’s one thing a writer learns very quickly—the setting is not the story. This is why I’ve written everything from westerns to post-apocalyptic tales, and as a reader I roam even further afield. I’m after the story. Sure, I have my favorite genres, and some plots seem to lend themselves better to some settings than others, but if a story is good I don’t care what genre it’s in. The current craze over post-apocalyptic fiction has been explained in many ways—fears over our deteriorating environment, the current economic crisis, international terrorism, etc. Whatever the reason, a grim future offers plenty of scope for storytelling. In the face of adversity, people have to pull together to survive, or become selfish and live off others. Civilization may have fallen but people still fall in love, have deep-seated jealousies, have grand dreams and petty insecurities. People, no matter what situation you put them in, are still people. The secret to the show is that the characters are compelling. We really love these people, or love to hate them. The zombies are there to get them into the situations that bring out the best and worst about them. They could just as easily been living on a space station invaded by aliens, or occupied France fighting the Nazis, or a Wild West town menaced by outlaws. In a different decade or a different country, the writers would have chosen one of those settings. Back in 1901, M.P. Shiel wrote The Purple Cloud, one of the original “last man on Earth” scenarios. But, like Walking Dead a century later, it was about more than the fall of civilization. It was about humanity’s hubris. People have been projecting their feelings onto apocalyptic novels for a long time now. So if it’s all about the story, why do so many readers have a favorite genre? I suspect there are as many answers to that as there are readers. Some of it may be dictated by the zeitgeist or childhood memories, or a person may have been blown away by a particular book and that led to a permanent craving for more in that line. What’s your favorite genre and why? Tell us what you think in the comments section. I’ll be hanging around here a while. 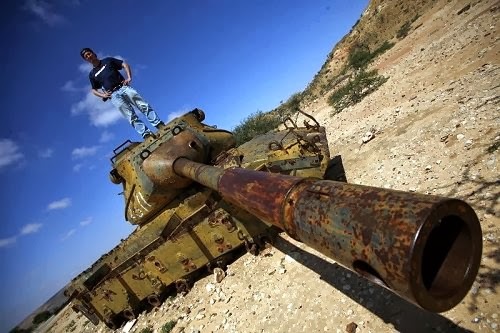 Sean McLachlan is an archaeologist turned writer who is the author of several books of fiction and history. Check him out on his blog Midlist Writer. The assistant mayor of humanity’s last city hopes he will never have to take command. 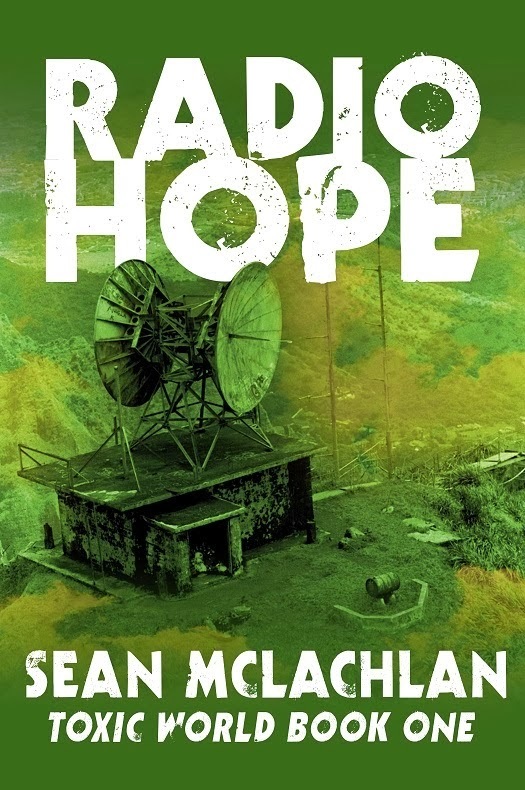 One thing gives them the promise of a better future–Radio Hope, a mysterious station that broadcasts vital information about surviving in a blighted world. But when a mad prophet and his army of fanatics march out of the wildlands on a crusade to purify the land with blood and fire, all three will find their lives intertwining, and changing forever. My new realization on "Show vs Tell"
Man, I thought I’d have time to post yesterday, but a friend got married and me, my gran and my mom did the flowers for her. Being a total novice at flower arranging, I thought it’d be easy. It wasn’t. We spent most of the past two days standing, and believe it or not, those arrangements are HEAVY. Add to that the fact that it was a garden wedding with no shade and at the hottest part of a summer’s day, and it all adds up to exhaustion. But today I’m a bit more relaxed, putting up my feet and reading my new crit partners’ WiPs and suggestions for mine. One WiP I’m critting got me thinking about something interesting. We all know about the “rule” show don’t tell. And if you’ve been writing and reading about writing long enough, you’ll know why this “rule” exists. It draws the reader in more, letting him/her experience the story as close to the same way as the character as possible. Doing that, the reader gets sucked in, which is something any fiction writer worth his/her salt should want. There’s something else I realized just now, that I thought I should share. Showing events rather than telling gives us as writers more scope in a story. It gives us more depth. Let’s say, for example, that the main character’s mother died at a young age. You as writer could mention it briefly and let the story progress (telling) OR you could show the effect the mother’s death has on the character. So how does this open up the story more? By exploring something you would have just mentioned, you might find the internal conflict you didn’t know you needed. You might even find a subplot that makes the main one stronger. You might even find a solution to a plot hole in a surprising place. So showing strengthens a story in more ways than the conventional wisdom states. Don’t miss a chance to expand your book’s horizons, just because a scene doesn’t seem to fit the plan. It might just be the difference between a good read and a great one, and leaving emotions un-shown is just one huge missed opportunity. Have you found an unexpected but perfect story element by delving deeper into something a character just mentioned in the rough draft? I goofed! Somehow, I got my dates confused for the blogfest, so I’m doing day one and two together. Sorry everyone! I’m supposed to write about movies I loved, but where the original novel left me cold. Or the movie that prompted me to read the book. Usually, those are one and the same. I know it sounds odd, but I have this interesting (and often useful) issue. I don’t forget something I’ve read or seen. Ever. Yes, details might grow squiffy, but I only need to see an image associated with the story or read a bit of it, and I recognize it instantly. The blessing in this is that I have this living encyclopedia of plots in my head. The curse is that if I read a book first, the movie will be ruined, because it jars with the story I have in my head already (and hopefully liked). The same is true for the reverse. So, to think of a recent example, The Lucky One, by Nicholas Sparks. The changes to the movie weren’t all that big, but big enough to spend most of the book going “hey wait” and comparing it with the movie I’d enjoyed. And anything that jars me out of the story gets to me. In a sense, I’m more forgiving if I read the book first. I guess it’s because I can see film adaptions as items to themselves, while the book always feels connected to the movie for me. So that’s what I do these days. I either read the book first, or I avoid reading it at all. Anyone else share my unique brand of insanity? A modern remake of Scaramouche by Rafael Sabatini.